What are the symptoms of Grave’s Disease? Unexplained weight loss, a rapid heartbeat, unusual sweating, swelling at the base of neck and eye problems are some of the common symptoms of Graves' disease. Graves' disease is named after Sir Robert Graves, who discovered the disease in the early 19th century. It is one of the most common of all thyroid problems and a leading reason behind hyperthyroidism, a condition in which the thyroid gland produces excessive hormones. The symptoms of the disease can cause discomfort, but there are no long-term adverse health consequences related to the disease. Below are the symptoms of Graves’ disease. Graves' disease patients exhibit a thyroid condition (hyperthyroidism). There could be other reasons for hyperthyroidism such as thyroid nodules or thyroiditis. There is an autoimmune component to Graves’ disease. The body's immune system attacks the thyroid gland which makes it secrete too much thyroid hormone. It increases the metabolism. Graves' disease can cause swelling of tissues around the eyes, which creates a characteristic "staring" or "frightened" appearance. The eyes bulge out and the eyelids appear to be pulled back. There is less blinking. The person may have double vision, itching and weeping. 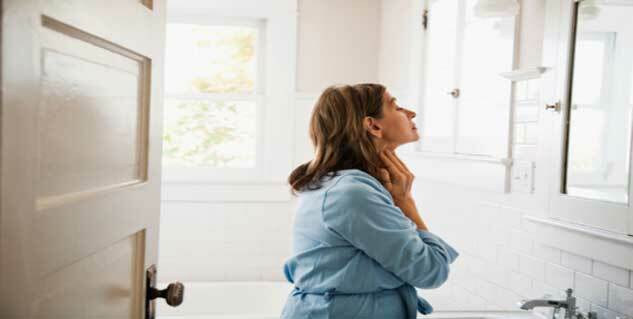 Goitre is a swelling in the lower front portion of the neck caused by an enlarged thyroid gland. Rarely, there may be swelling of the feet and lower legs. Skin in this swollen area may appear thicker and darker than normal skin, and it may itch. One of the symptoms of Graves’ disease is rapid heartbeat (tachycardia), a condition where there are more than 100 beats a minute. Irregular heartbeat (arrhythmia) or pounding of your heart (palpitations) are also linked to Grave’s disease. Graves’ disease can cause sudden weight loss. Your appetite, the amount and type of food you eat remain the same or even increase but you keep losing pounds. In women, menstrual periods may become less frequent or stop altogether. In older people, particularly people with heart disease, the disease may cause heart failure or heart-related chest pain called angina. Nervousness, anxiety and irritability, trembling in your hands and fingers, sweating, increased sensitivity to heat, changes in bowel patterns, fatigue, muscle weakness, difficulty sleeping, skin thinning and brittle hair are the other symptoms of graves’ disease.